The OnRisk platform delivers a CAD-style, graphical, interactive toolkit for the structuring and placement of high-value property & casualty (P&C) risk. OnRisk’s cloud-based platform provides corporate risk managers, ceded reinsurance specialists and their brokers with an intuitive, user-friendly view of these complex risks to expedite placement and improve buyer outcomes. The Jigsaw Tower (TM) application transforms the commercial re|insurance placement process into a graphical, intuitive and visually-appealing online experience for brokers, buyers and markets. The online risk editor provided by Jigsaw Tower (TM) enables a broker or underwriter to assemble the quotes and coverages received from many markets into a unified, coherent program. Using the application’s risk sharding tools, a broker or buyer can piece together coverages using a specialized graphical interface; select quality carriers and verify layer pricing for insurance towers; and design complex subscription programs aided by real-time business metrics. 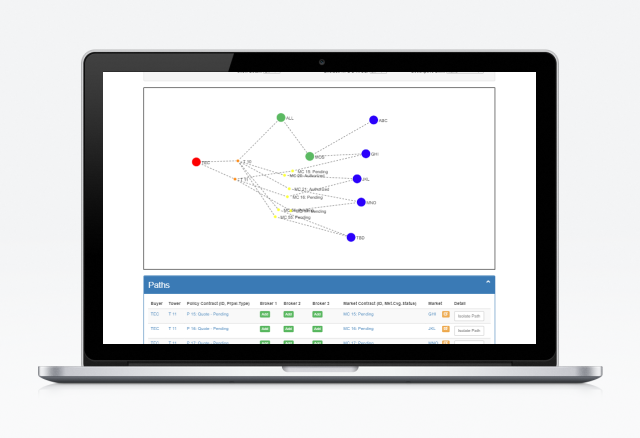 The Distribution Tree (TM) application enables OnRisk’s clients to represent and analyze risk transfers from buyers, through brokers, to carriers. Distribution Tree (TM) allows users to see, at a glance, how different elements of risk towers are placed, through one or more brokers, with multiple insurance or reinsurance carriers. Users can review placement status, or analyze alternative distribution strategies, in seconds, without slogging through email chains or pages of spreadsheets. This application brings deal distribution into sharper focus, and places it at the center of each complex risk placement. The Geo Distribution Tree (TM) application extends the Distribution Tree (TM) application by providing a geographic snapshot of the risk location, and the global distribution network used to place a complex risk. The application highlights the location of each insured, risk and market by jurisdiction, thereby enabling the enhanced tracking of policy regulatory status by party and jurisdiction. The data export-import facility enables OnRisk's clients to upload pre-existing companies and programs from spreadsheets to the web application; distribute placement data for external client review; export bound coverages and premiums to back-office processing systems; or back up business data by clicking once to download the application database.